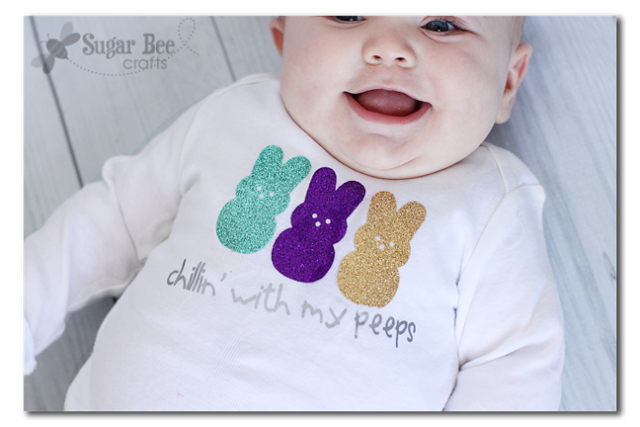 I needed something quick and I knew of the perfect quick and easy project – a peeps shirt! Of course I had to have my mom swing my niece by my house so I could do an impromptu photo shoot – because let’s face it, cute babies make pictures even cuter. UPDATE!! 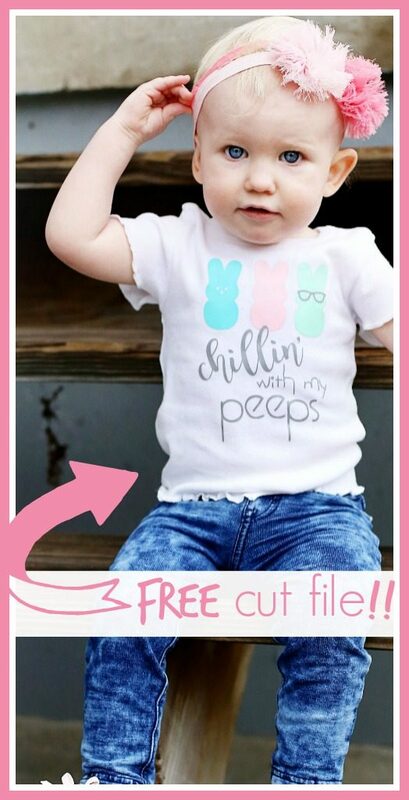 I have another Chillin’ With My Peeps file – – now you have options 😉 Find that project post HERE. You can find a tutorial for layering HERE and using the glitter transfer HERE. –I cut the heat transfer glitter using the “flocked heat transfer” setting on my Silhouette. –I traced the peep shape with the tracing function. –When cutting text, be sure to MIRROR the image before cutting – – I know to do that, and I still forgot the first time I cut it – oops! You do this because with Heat Transfer, you actually cut the back of the vinyl (put the shiny side of the sheet down against your mat) and then flip it over to iron it on to your item. –Use a pretty hot iron with a thin cloth between it and the vinyl. Slowly peel off the clear sheet and iron the design again to be sure it’s set well. –If you want to see in action how to use it, I have a short Heat Transfer Vinyl video tutorial you won’t want to miss. My original idea was to have 5 peeps because with my kiddos and my niece, there are 5 cousins. 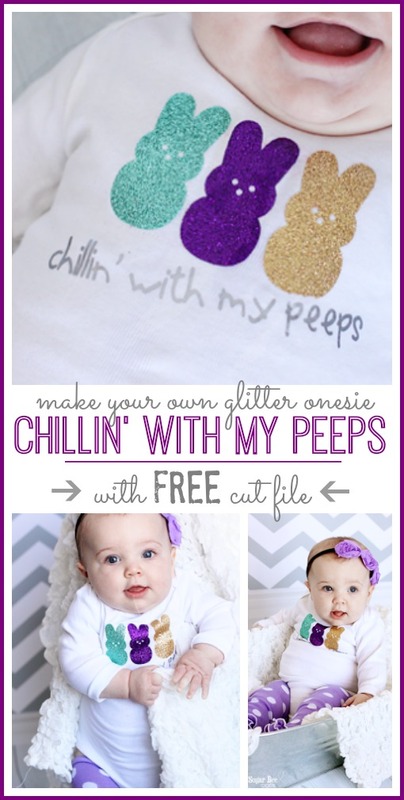 But 5 glitter peeps on a onesie took up too much room – – so I went with 3. Still cute. I put “chillin’ with my peeps” at an angle for that extra pop of fun. You’ve probably noticed, but one of my FAVORITE things to use is heat transfer vinyl. 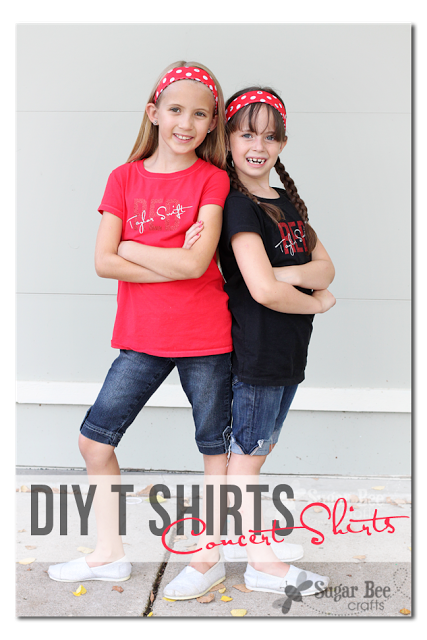 I stock up on plain tshirts when I see them at thrift stores or on sale, so I always have some on hand when a project calls. It’s just such an awesome way to add personalization. On top of that, my FAVORITE type of heat transfer vinyl is GLITTER Heat Transfer Vinyl (because everything needs a little sparkle!) and Expressions Vinyl (affiliate link) has tons of color selection in that category – you won’t be disappointed. If you haven’t used it yet, what are you waiting for – try it! I included several tips, but the biggest one is…. MIRROR the text before cutting – – I know to do that, and I still forgot the first time I cut the “chillin with my peeps” – oops! You do this because with Heat Transfer, you actually cut the back of the vinyl (put the shiny side of the sheet down against your mat) and then flip it over to iron it on to your item. She’s just learning to sit – – we got a few pictures before she toppled over. How about that it happened to be her 6 month birthday – so the impromptu pictures can double as milestone pictures. Bonus! 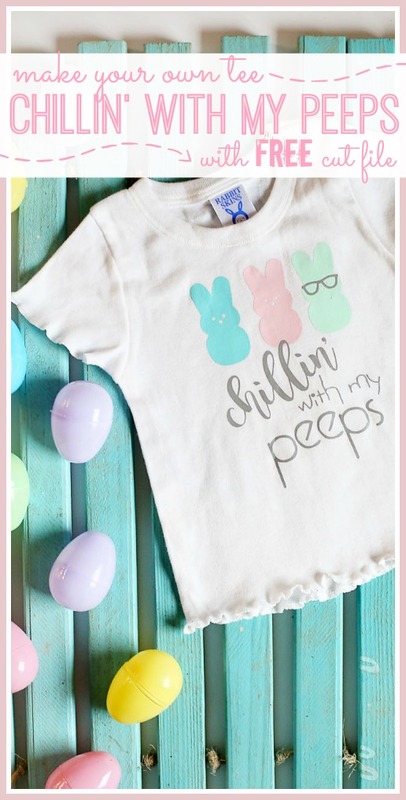 Enjoy making your Chillin’ With My Peeps shirt!! Oh wow, the shirt and the baby could not be any cuter. I LOVE the glitter peeps!! Off to research this heat transferred vinyl…! it’s a free download here – you can just click over to the free cut files and download from there – hope that helps! i having a little hard time trying to get this to work , i downloaded the file for the chilling with my peeps but before i cute it i have to print it with my canon printerin color and then cut it and i cant figure iut how to print the file i just downloaded with color first some help me ! Sorry, it’s a Silhouette cut file, so it’s made to pull into the Silhouette software – my goal is to convert it to an SVG! She is adorable!!! And the peeps shirt is too cute too! Love the glitter iron on! This is Adorable Mandy! I love the color choices. This turned out fabulously! Way to pull something AMAZING together in the final hour. (And I totally know what you mean about deadlines creeping up. I have one myself this Saturday. Eek! Better get on that stat.) Great job, Mandy. I just tried on onie’s for my nieces new baby. I had so much fun I could go nuts with the vinyl. However, were did you get the shape to cute, or did you down load it? I have a cricut and I don’t recall any of the images looking like these. Thank you. I guess I could do that and actually cut it out. Mandy: Thank for your response. I am not really familiar with a Silhouette so forgive me for asking if this doesn’t work lol. Any chance there is a jpg version of this file? Sorry, I’m not sure how to have the file as a jpg since it was created inside the silhouette software…. but I’ll look into it – there’s got to be a way…. Have you converted it to a SVG file yet? It’s so stinkin cute but I have a cricut and need an svg. yep!!! it should be there! Absolutely adorable. Can I ask what font you used for the words? When I downloaded the file the font did not come through with the cute one you used here! Thanks! just checked for ya, and it’s a font called “His Name is Honey” – I’m sure it was a free download from somewhere, but I’m not sure where, sorry – good luck! Thanks so much just found it!!! So glad you asked (and answered!) I had the same problem. This is so cute! Thank you so much for the file! I am obsessed with this shirt you made! Your niece is adorable too!!! I don’t have a machine yet but am planning on getting a Cricut Explore Air, hopefully before Easter. Is there a way that I can download this as a .svg or another file type than studio? I’m trying to figure out a way, but I’m not having much luck. If you want to replicate it, the font I used is called His Name Is Honey and then you can just trace the shape of a peep online. Hope that helps! I’ve see the “chillin with my peeps” done quite a few ways, but this is definitely my favourite!! Is there anyway the file could be saved as an svg file. (So I can use it on a cricut) ? Sorry I just saw the answer to a previous comment that you are working on it. I can’t down load the free file of the peeps. Any idea why? Anyone else having this problem? 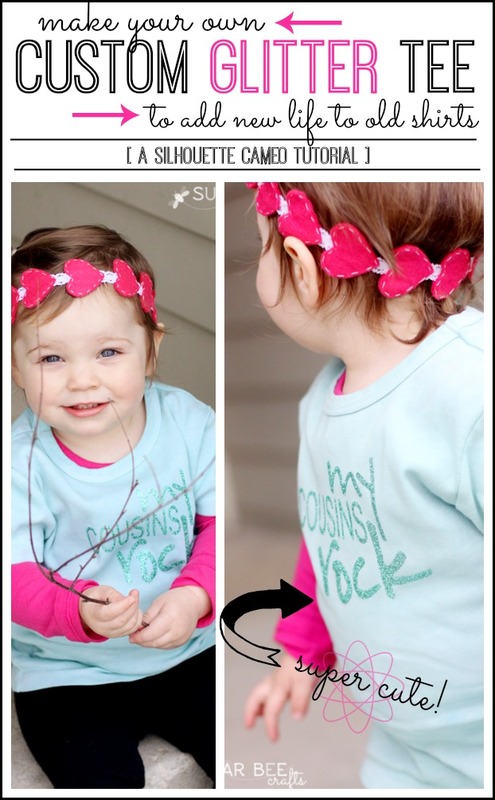 It is such a darling idea that I want to make one for my granddaughter. it’s in a format to be used with a Silhouette machine, so you’ll only be able to open it with the Silhouette program – maybe that’s the problem?